The short-term business outlook in Canada remains robust. 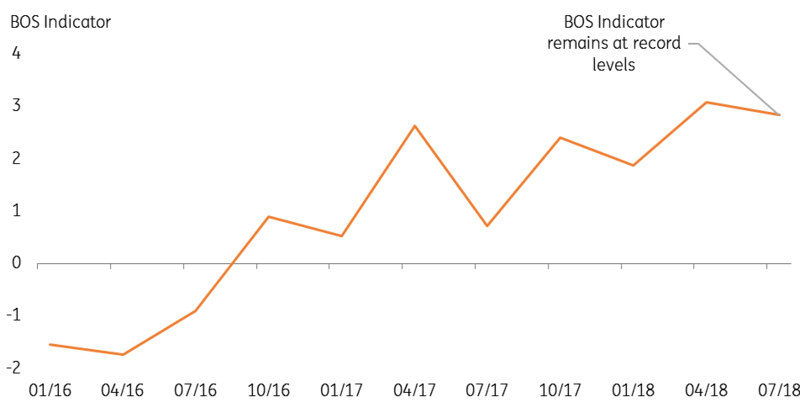 That’s the message from the Bank of Canada’s (BoC) Autumn Business Outlook Survey, which pointed to solid activity even before the recent trade breakthrough. Strong demand, investment and employment intentions have helped to keep the indicator near record levels. Here are our three key takeaways…. The survey’s gauge of future sales growth edged up from the last reading in July. This tallies with our own growth expectations, where exceptionally strong US activity will continue to bolster the Canadian economy through the rest of the year. It should be a similar story in 2019, although US growth may ease to some degree as higher borrowing costs feed through and the fiscal boost begins to moderate. All of this appears to be translating into higher Canadian capital spending, with the survey’s investment indicator rebounding in the latest figures. 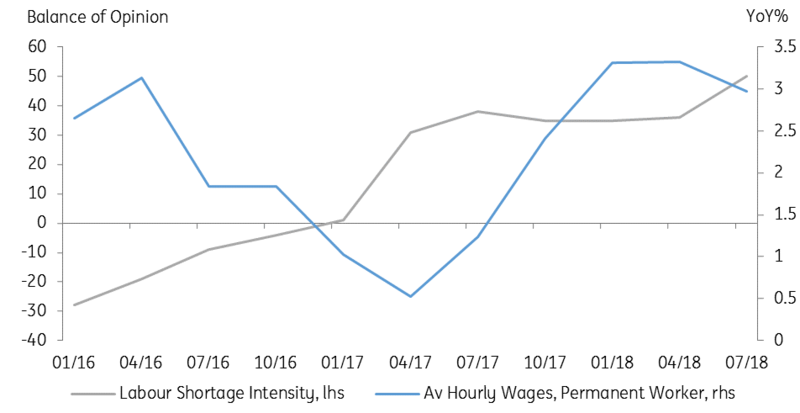 Canadian wage growth has been a bit disappointing over the summer months, but interestingly the latest BoC survey indicates that firms are continuing to face widespread labour shortages. More specifically, firms appear to be struggling to source labour with specific skills, with shortages concentrated in construction. Whatever the reason for this – be it supply constraints or structural factors such as the ageing population – it should help prevent Canadian wage growth from falling further over the coming months. A big question for policymakers at the moment is how the recent increase in trade tensions will feed through to inflation. Certainly, the latest survey showed input prices rising fairly sharply, although the recent rise in oil prices is likely to be a more significant factor here. So far, the impact of tariffs on consumer price inflation has been fairly limited, and it’s likely that competition will see some firms opt to absorb a large chunk of the extra costs. In general, we expect headline inflation to ease over the coming months as energy base effects kick in. But with most measures of core inflation around the BoC’s 2% target, we expect the central bank to hike rates when it meets next week.